It may be hard to recall (or even imagine), but there was a time when concrete moulded flagstones were the zenith of paving production in Britain and Ireland. Only gazillionaires and local councils could afford natural stone flags so Joe and Joanna Public had to find satisfaction in a modest offering from most of the major manufacturers, some of whom have since disappeared (oh for the simplicity of the three-size, four-colour Marley range! 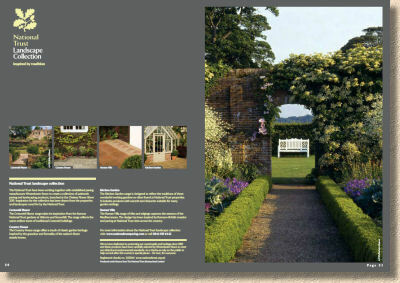 ), but most have shifted almost seamlessly away from manufacturing and into the distribution of imported stone paving. However, there is still a small number of what we might think of as "Traditionalists" who keep the vibrating tables a-buzzing by producing wet-cast moulded flagstones in a bewildering spectrum of quality, from the 99p producers selling their one-winter-wares in the immediate local area, to the dwindling ranks of genuine mould masters who manufacture stunningly good paving for nationwide distribution. Ask anyone who has been in the paving game for more than a decade, and they are bound to name Westminster Stone as one of the best. There's more than a quarter of a century of manufacturing experience behind them, and sometimes you have to marvel at the tenacity it takes to last for that long in what can be a treacherous and unpredictable business. We've seen stone sellers struggle to last 25 months, let along 25 years, so when someone notches up such a stint, you know they must be doing something right. And what it is that Westminster Stone do right is produce reproduction flagstones of impeccable quality, using their own specially-crafted moulds and not skimping on the quality dyes and plasticisers to create concrete flagstones that are not just better than average, but are probably the best in the country. As already mentioned, times are hard for paving manufacturers generally, and companies producing reproduction materials are having it even harder, so innovation and range expansion are severely curtailed, but Westminster have managed to buck that trend by acquiring the prestigious role of manufacturing the official National Trust range of paving. This has been covered previously on the website, so no need to repeat it here, but it deserves mentioning because it forms the bulk of the changes that are to be found in the latest brochure published by the company. The overall look is very similar to Edition 7 published back in 2010, with its soft yellow colouring, 48 pages of heavyweight quality paper, and the predominance of photos; page after page stuffed to the gunwales with photos, which is no bad thing because it's the photos that sell, much more so than some vacuous marketing prose extolling the alleged virtues of the products. And there's obviously some discernment about which photos deserve prominence, because most of those afforded a full page or a bigger allocation of real estate are genuinely cracking images that any manufacturer would love to have in their "collection". The one surprising thing is the relative paucity of space given over to the National Trust Collection. It's fully understood that, to make room in just 48 pages for this fairly comprehensive range, something else has to be cropped or diluted, and that the collection has its own stand-alone publicity, but even so: this is the 'Killer App' for Westminster Stone and I can't help feeling it has to be worth more than just a double page spread. 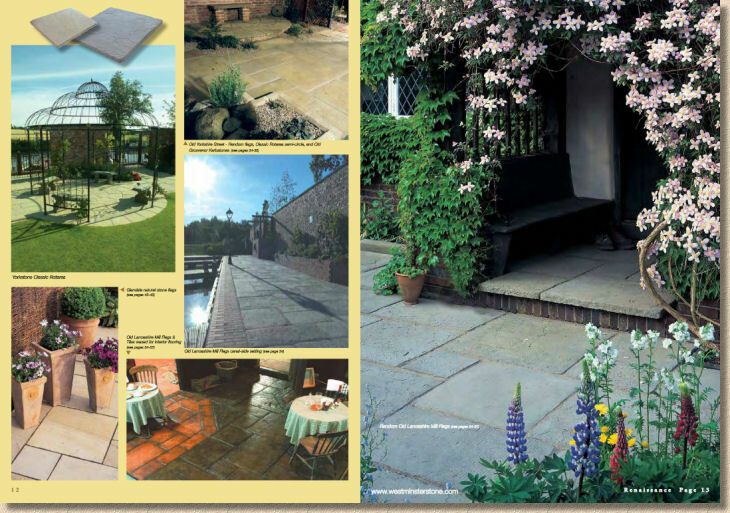 If use of flagstones for internal flooring warrants four pages, then surely this most consumer-friendly of product ranges with all its emotional appeal and genuine quality, deserves more than two measly pages, doesn't it? Other than that, the catalogue remains essentially unchanged. The photos remain staggeringly good; the packaging and tech info is concise and well-presented, if a little crowded (back to the space problem once again), and the laying guidance is faultless (of course! I wrote it! ), although the proviso that pavingexpert.com is "probably" the UK's most comprehensive and easy to use paving reference is undeserved. There's no probably about it! One other notable difference, if that's the correct word, is that Westminster are pushing the digital version of the brochure rather than the more traditional print version. Obviously, there are significant cost savings to be made with a digital version, and it's arguable that digital is actually better, because the images can be scaled to a size greater than that in the hard copy, plus there's the convenience of having it taking up next to no room at all on a laptop or a tablet which contractors can show to clients at their leisure. A print version is still available and will be stocked at the official Westminster Stone distributors up and down the land, as well as being available on request via the website. In not too many years, will there even be print versions of all these brochures, catalogues, collections and portfolios? For all their traditional styling and homely Middle-Britain charm, Westminster has long been an early adopter of digital technology. I recall working with them on an early online paving and hard-landscaping store two or three years before anyone else had really pushed the idea, so it's no surprise to see such a good implementation of the digital brochure, and where Westminster lead, others tend to follow. We can only hope that the others go for the same easy-to-use, high quality solution as that employed by Westminster. 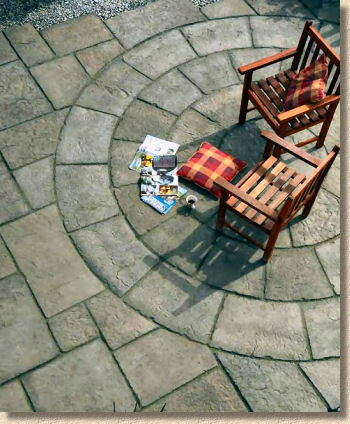 Overall, if you are looking for reproduction flagstones, then Westminster Stone has to be right at the top of your list. 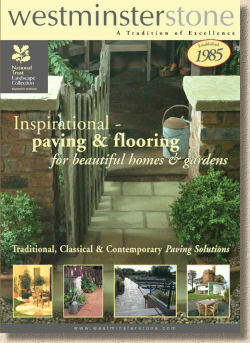 Treat yourself to their digital catalogue and remind yourself of just how good reproduction paving can be. Keep it on your hard drive, and if you get the chance, show it to your customers. They'll love you for it!